Poland won their second tie in men’s team Group 6 at the 2018 European Men’s & Women’s Team Championships when they beat Portugal 4-1 yesterday in Kazan, Russia. Poland shot to a 2-0 lead through Michal Rogalski and Adrian Dziolko (featured image) in singles. Rogalski needed just 20 minutes to beat Duarte Nuno Anjo 21-8 21-12 before Dziolko held off a spirited challenge from Bernardo Atilano, 21-17 21-18. Portugal fought their way back into the tie through Bruno Carvalho who outplayed Mateusz Danielak 18-21 21-16 21-13. However, Poland’s strength in doubles was too good for Portugal. Pawel Smilowski and Przemyslaw Szydlowski routed Duarte Nuno Anjo and Bernardo Atilano 21-16 21-7 in the first Men’s Doubles before Adam Cwalina and Milosz Bochat made it 4-1 beating Bruno Carvalho and Tomas Nero 21-14 21-10. In the same group Czech Republic blanked Italy 5-0 to lead the group, just ahead of Poland. Most of the day’s matches finished 5-0 or 4-1. In Group 3, Azerbaijan took a match off Iceland when Azmy Qowimuramadhoni beat Daniel Johannesson 21-12 21-18 to make it 1-2 for Azerbaijan. However, Iceland won the two doubles in straight games to win the tie comfortably. Russia recovered from the loss of the second match to Spain to record a 4-1 result. Luis Enrique Penalver made it 1-1 for Spain after they had lost the opening singles. Vladimir Ivanov then made it 2-1 for Russia after which the two Russian doubles pairs asserted their superiority. In the women’s competition, Hungary beat Slovakia, Sweden beat Israel, England beat Czech Republic and Poland beat Norway by 4-1 margins. Slovakia drew first blood against Hungary as Martina Repiska stormed past Agnes Korosi 21-14 21-14. 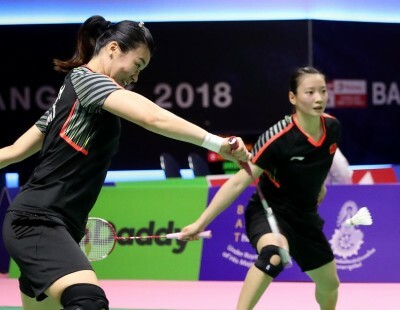 Hungary fought back through Daniella Gonda and consolidated through Vivien Sandorhazi to make it 2-1, after which the two doubles pairs helped Hungary to a 4-1 victory.